CORE Sensor Bar – The most progressive bar in the world! The first hollow bar from one mould. Thanks to the unique Unibody construction, without overlapping connections, the weight of the SENSOR-Bar has reduced by 43% whilst at the same time increasing the breaking load. 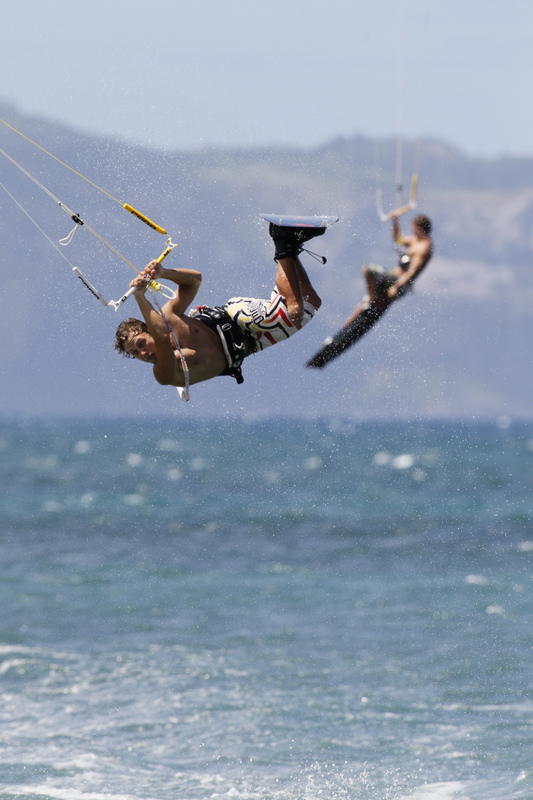 The trick with the improved kite feedback lies in the intelligent mass distribution and reducing the mass moment of inertia (by 55%) which enables a noticeably more direct feeling of the kite. 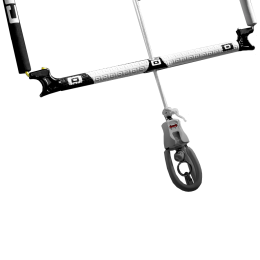 The leveled bar ends significantly reduce, through improved leverage, the bar steering force. The connecting pin, on the underside of the bar, is made from pure titanium (Ti) which further reduces wear when adjusting the depower lines. The hollow Unibody of the SENSOR-Bar is made from a newly developed high performance material, an innovation Made in Germany. The SENSOR-Bar has an increased breaking load compared to its predecessor. The ergonomically designed rotor quick-release is absolute innovation. The bi-directional release mechanism enables an Intuitive safety release with the least amount of effort. In contrast to traditional systems there is no power required against the flow of the water. 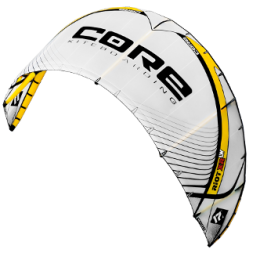 At CORE the entire safety system, quick-release and the new leash, work together harmoniously. With this the SENSOR-Bar not only more than meets the highest standards, but also sets new levels in safety. 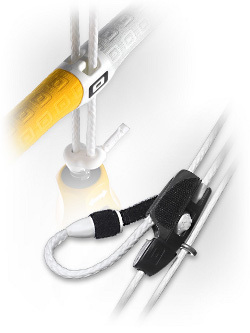 The laterally fitting chicken stick avoids the accidental unhooking from the harness hook. With unhooked maneuvers it glides to the side to ensure that it is not in the way when hooking in again. When closed the quick-release prevents sand from entering the spring mechanism. Should sand enter the ROTOR quick-release body, the transparent material ensures that it is easily detected and can then be rinsed out. The construction is simpler than ever. 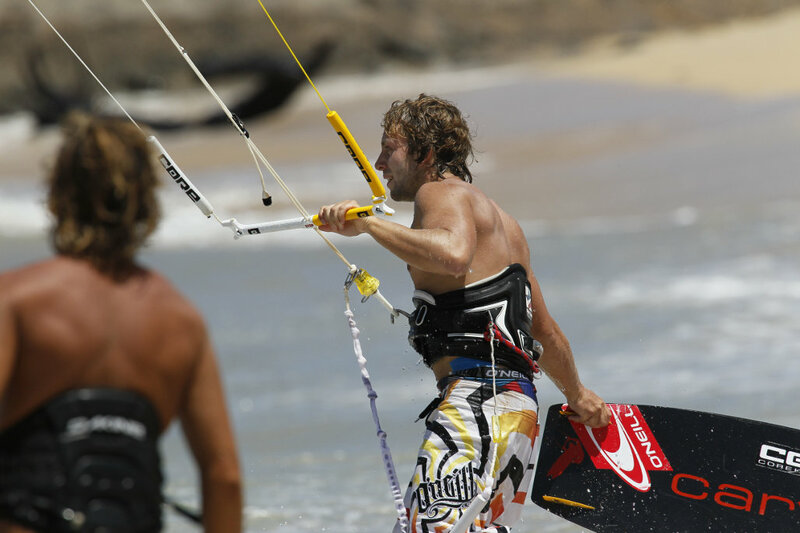 The safety leash release is visible at the front of the harness for a quick and intuitive release. This guarantees an unbeatable level of safety. 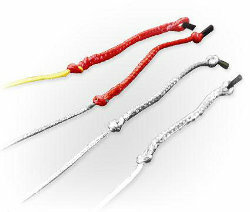 Only the CORE Leash-System guarantees the highest level of safety. 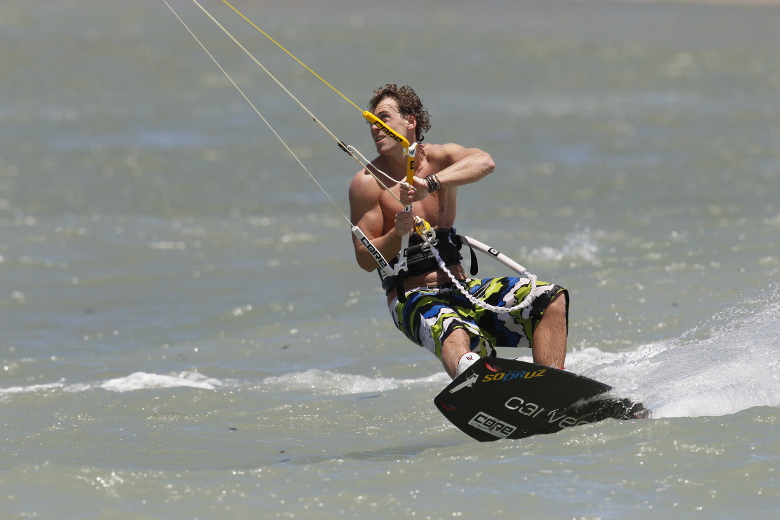 The configuration of leash components and the individual components used prevent the safety leash from being jammed against the harness – especially after release of the quick-release. 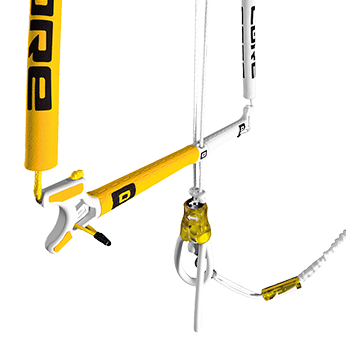 At CORE the entire safety system, quick-release and the new leash, work together harmoniously. 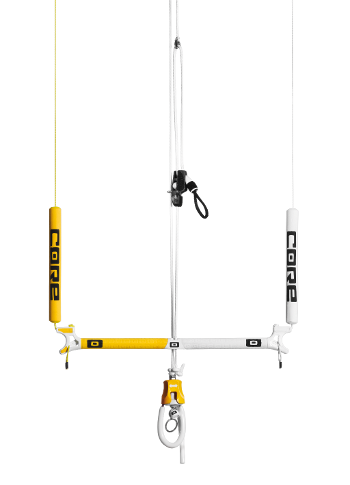 The mid-bar grip ability was optimised with a further development of the line guides. The successively ordered depower lines now take up no more than 4mm – ideal for the one-handed mid bar hold. And the best thing is that with the noticeably thinner bar diameter the bar feels as light in the hand as it really is. The new adjuster halves the trimming effort required. And lastly the SENSOR-Bar is suitable for all kite sizes. The new adjuster system is an improvement against all currently available cleat systems. The reason for this: the forces working on the cleat adjuster are halved by adding an additional redirection over a low-wear adjuster. This results in the system operating with less trimming effort and further allows a more accurate trim setting, even at the upper wind ranges. The 20% lower height of the rotor quick-release body improves access to the adjuster. The depower travel can now be adjusted with a simple adjustment of the trimming cleat. The easy bar length adjustment, with the line attachments at the bar ends, allows the SENSOR-Bar to cover the entire kite range, from 5 to 19 m2, with one bar. All the SENSOR-Bar lines come from the German manufacturer LIROS to ensure a high standard of quality. The back lines of the CORE SENSOR- Bar have a breaking load of 368kg at a diameter of only 1.8mm and are very user friendly when laying them out during set-up. After assembly, the entire line length from the chicken loop, over the front lines up to the end of the front flight lines are pre-stretched with 200 kg. The SENSOR-Bar achieves an additional stiffening of the power lines by splitting the force onto the, depower line integrated, safety line. The spliced line ends are unique. They are no longer sewn in parallel and as a result their rigidity is increased by 20%. A positive side effect of this is that the laying out of the lines is noticeable easier and faster. 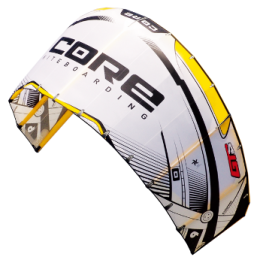 CORE has not only made the SENSOR-Bar more direct, safer and more comfortable, but has also equipped it with features that will appeal to the Pros. 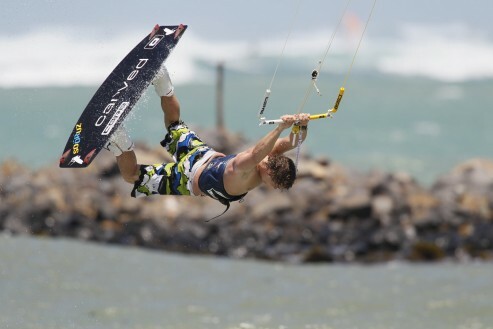 The suicide mode allows the experienced rider to practice unhooked tricks, without the kite completely depowe- ring after releasing the bar. The safety ring, to which the leash is attached, is simply attached to the chicken loop. The safety of the rotor-function is 100% unaffected. PRO-LEASH – Possibly the only pro leash on the market which cannot be jammed behind the harness. 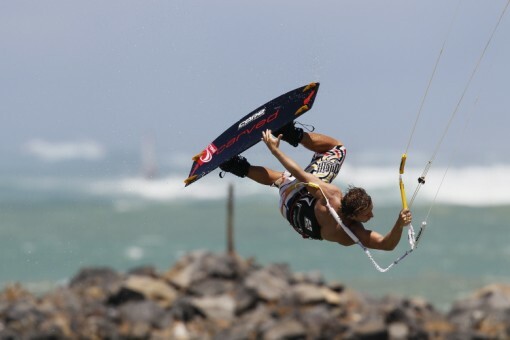 PRO-LOOP – Longer chickenloop for pros that perform a lot of unhooked moves and want to hook in quickly – the path to the adjuster is however lengthened. The SENSOR-Bar is compatible with the GTS2, GTS, GT, Riot XR2, Riot XR2 LW, Riot XR, Riot XR LW, Combat and lots of 4-Line-Kites by other brands.